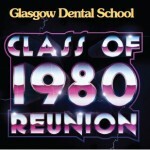 On Friday 11 December, FGDP(UK) Scotland and the Glasgow Dental Alumnus Association are proud to host reunions for Glasgow Dental School’s Classes of 1980, 1985 and 1995. 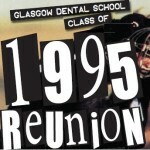 Get together with your classmates to celebrate 20, 30 and 35 years in dentistry. Participants can enjoy a day of top quality CPD at the Faculty study day on Friday 11 December before rounding off the evening with a relaxed reunion meal. Re-visit your youth with a tour of the dental school the following day. The day is entirely flexible so just choose the parts of the day you would like to attend. Reduced rate accommodation at two Glasgow hotels. Email Andrew Miller at events@fgdp-Scotland.org for the booking codes.